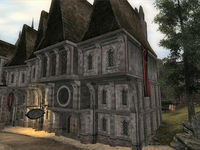 Skingrad Mages Guild is found in the north end of the city, beside the Fighters Guild and across from Colovian Traders. It specializes in Destruction magic. 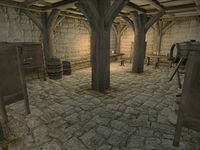 The building is divided into Skingrad Mages Guild, Mages Guild Living Quarters, and Mages Guild Basement. The Skingrad Mages Guild is the only Mages Guild in Cyrodiil with no on-site alchemist, meaning Falanu Hlaalu at All Things Alchemical and Sinderion at The West Weald Inn are the town's only sources for alchemy equipment and non-food ingredients. The front door of the Mages Guild reveals a small entrance with a doorway on each side, and a set of stairs beyond them on each side. Druja can often be found here. Through the doorway on the left, a small room holds only a lectern which contains clutter and/or a book. The lectern does not respawn. Vigge the Cautious can often be found here. 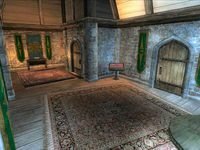 The door on the northwest wall leads to a small bedroom with a single bed available for Mages Guild members. The cupboard in the alcove can contain clothing, as do the two chests of drawers stacked opposite the cupboard. The chest beside them contains only clutter. All of the containers in this room respawn. The door to the right upon entering the building reveals a large room where Sulinus Vassinus can often be found. The display case in the northern corner holds a copy of Magic from the Sky and a Welkynd Stone. The door opposite the case leads to the basement. Both sets of stairs in the main entrance lead up to one large room where Adrienne Berene can often be found. In the northeastern end, two tables hold a full set of alchemy apparatus, and two empty soul gems - one lesser and one petty. The large bookshelf here holds two alembics, a retort, and a mortar and pestle. The stairs here lead up to the Living Quarters. In the southwestern end, a single table holds another full set of alchemy apparatus as well as a petty soul gem. The large bookshelf here holds another alembic and mortar and pestle, and two calcinators. In the central area of the room, two small bookshelves stand on each side of a stained glass window. The one on the left holds two more calcinators and a copy of The Wolf Queen, v 8, and the one on the right holds two weak poisons - one of burden and one of sickness, as well as a strong poison of severing. A few shelves up, there's a rare copy of Mysticism. The northernmost of the two large bookshelves contains more apparatus - two retorts, two calcinators, two mortar and pestles, and an alembic. The other holds another alembic, retort, and calcinator, as well as several ingredients - two ginkgo leaves, two ginseng, two columbine root pulp, and one sample of fire salts, bonemeal, and aloe vera leaves. The stairs in the north of the room lead up to the Living Quarters. Upon entering the third floor, an alcove to the right holds two respawning clutter chests. To the left, in the entrance area, a display case in the southern corner holds a dryad saddle polypore cap, harrada, troll fat, and a minotaur horn. The display case in the northern corner holds two empty soul gems - one petty and one lesser. The door opposite the entrance reveals a small bedroom with a double bed in the west corner. The desk in the southern corner holds only clutter, as does the cupboard beside the door. The two chests of drawers beside the desk hold clothing, and the chest next to them holds gold, and possibly jewelry and clutter. This chest does not respawn; however, every other container in this room does. The bedroom next to this one features another double bed on the southwestern wall. The chest next to the bed contains only clutter, as does the cupboard next to the door. The chests of drawers between them both contain clothing. On the table in the eastern corner sits a retort, mortar and pestle, and calcinator. All of the containers in this room respawn. The bedroom across from this one is larger. A double bed sits against the southeast wall. A desk in the northwest corner holds only clutter, and on top sits a single empty lesser soul gem. In the alcove in the north end of the room, the first cupboard on the left holds clothing; the rest contain clutter, as does the chest against the wall. On the small bookshelf sits a copy of the alteration skill book Daughter of the Niben, and another alembic is on top of the shelves. All of the containers in this room respawn. Down the stairs to the basement, a clutter cupboard sits with three sacks on the floor next to it; the tied ones holds clutter, and the untied one holds food. On the southeast wall, two clusters of garlic hang from the ceiling. In the eastern corner, two barrels hold food. On the northeastern wall, a pumpkin, three ears of corn, and a head of lettuce sit on a table. The cupboard next to it holds drinks. On the table in the northern corner, two cheese wedges sit on a plate, beside a loaf of bread and a bottle of beer. A bookshelf in the western corner holds another two loaves of bread, another two ears of corn, and another head of lettuce. The cupboard here holds food, as do the two barrels beside it. The sacks in this room do not respawn; however, every other container in the room does. Esta página foi modificada pela última vez à(s) 17h54min de 3 de junho de 2013.